Donald W. Lemons, Chief Justice of the Supreme Court of Virginia, has been named the recipient of the William R. Rakes Leadership in Education Award from the Virginia State Bar Section on the Education of Lawyers in Virginia. The award recognizes an individual who has demonstrated exceptional leadership and vision in developing and implementing innovative concepts to improve and enhance the state of legal education, and in advancing relationships and professionalism among members of the academy, the bench, and the bar within the legal profession in Virginia. Throughout his career, Chief Justice Lemons has been involved in educational efforts to improve the quality of lawyers in the commonwealth. He began lecturing in numerous continuing legal education seminars sponsored by the bar early in his career. He was a member of the MCLE Board, and was on the faculty of the Judicial Conference of Virginia and the Judicial Conference for District Courts. For years he served on the faculty of the bar’s annual disciplinary conference and on the faculty for the bar’s Harry L. Carrico Professionalism Course. He was also a member of the board of governors for the Education Section of the bar from 1994-97. Chief Justice Lemons served as the A. L. Philpott Distinguished Adjunct Professor from 1998-2000 and the John Marshall Professor of Judicial Studies from 2005-2007 at the University of Richmond School of Law. Since 2007, Chief Justice Lemons has been the Distinguished Professor of Judicial Studies at Washington and Lee University School of Law, where he teaches his extremely popular appellate advocacy class. Chief Justice Lemons has also been very engaged in the American Inns of Court. The mission of the American Inns of Court is to inspire the legal community to advance the rule of law by achieving the highest level of professionalism through example, education, and mentoring. In 2014 he finished two terms as president of the American Inns Of Court. 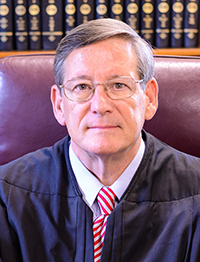 He has also been the Master of the Bench in both the John Marshall Inn of Court and the Lewis F. Powell, Jr. Inn of Court, and he was the president of the John Marshall Inn of Court in 2002-2004. In 2008, he was awarded the rare honor of being named an Honorary Master of the Bench by the Middle Temple Inn of Court in London. Among Chief Justice Lemon’s many awards are the Virginia Trial Lawyers’ Distinguished Service Award (2012), and the William Green Award for Professional Excellence (2006), which is the highest honor awarded by the University of Richmond School of Law.